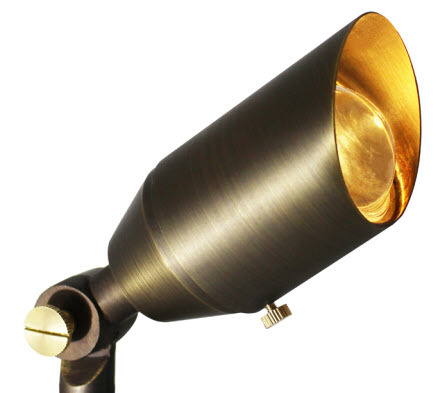 LED 12-volt landscape adjustable beam light fixture rated in solid brass for many types of general landscape lighting needs. This can work well for garden landscape lighting, and you can use it in existing 12-volt transformers. Ideal for general site lighting, landscape, sign lighting, flag poles, and pathways. The adjustable beam varies from 90-degree flood all the way down to 10-degree spot. - Solid antique brass finish. - 8.5-inch non-metallic spike included. - 3 foot lead wire. - Adjustable beam angle from wide flood to spot.